The LED Operating Theater Surgical Light can be used in multiple settings to meet the demand of the illumination, and it is the ideal medical illumination instrument of the modern operating theater. The whole reflection optical system is made by CAD/CAM technology, its illumine depth is up to 500mm; By using color temperature compensation technology, the color reversion is uprised, and is more suitable for the illumination of the complex surgery such as encephalon surgery and thorax surgery. Micro computer digital control, with 8 shifts luminance for selection and it offers illuminance memory funcition and wide voltage working speciality, cam work stably under AC 150V~250V, with strong anti-jamming capacity. Focusing system has a delicate structure, and easy to change bulb and the ceramic seat; Detachable handle cover can take high temperature (≤ 134° ) sterilization treatment. With back up bulb automatic switch function, when the main bulb was burnt, auxiliary lamp will be lighted in1/2 Second. There’s failure indication in the handle control panel, to recommend the bulb to be changed after operation. Offering soft start up unit, extending the serve life of the bulb effectively. Adopting the imported long life halide-tungsten bulb, the bulb life can be up to 1000 hours. The Spot center illumination(Lux.) at 5000K 120000lux. The Spot center illumination(Lux.) at 4000K 100000lux. 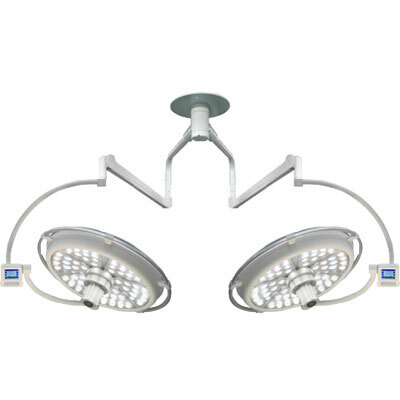 Surgical light heads measure 25.5"
Fully adjustable light pattern from 9" to 13"
Metal Halide reflector measures at 23"
Surgical light heads available in 16" & 20"
Luvis L200 w/ Mobile Stand Specifications We offer special pricing & volume discounts for Government, GPO, Health System, & Healthcare Facilities! Contact us for details. Luvis M300 Specifications We offer special pricing & volume discounts for Government, GPO, Health System, & Healthcare Facilities! Contact us for details.